Russian Court | I should have turned left! what a day … spoke to the mechanic who said bike is fine he fixed the hole in the radiator and now it is ok. I am VERY worried as I know about the hole and have been toping Dizzys radiator every day and trying to limp him to a mechanic. Then he died completely and everyone i.e. mechanics, me couple who towed me (and one is a mechanic) said this was really serious so I cannot understand how just fixing the radiator has cured him…well I guess I can only wait and see. Then my Russian friend in Zurich managed to find a translator for me in Irkutsk to help me with the Visas. I called him and asked him how much he charges and he said “if it’s ok with you I won’t charge you as I have not done this process before so can only try and help as best I can” WOW how nice is that and he was great spoke amazing English and has been a HUGE help. So basically we get to the immigration office and they go NUTS at me. Tell me I’m going to be arrested get me to write a whole doc with all details and then get interpreter to write it in Russian. Get every detail of date’s hotels where I stayed and then call them to verify that I stayed there. Then we go upstairs to the big boss and fill in a ton of bleeding Russian paperwork. We are there for 3 hours NOT waiting but actually being interviewed or should I say interrogated and filling in paperwork. She turns to the immigration officer and says why are you wasting my time this lady is clearly here because of circumstances beyond her control, why do you want me to punish her, you are wasting my time. He says it’s protocol that the senior immigration officer is on leave and no one other than him or a judge can take responsibility so that is why we are here. The protocol is that I must be fined. Judge goes off to her chambers to deliberate. Comes back and says ok guilty but I will give you the minimum fine of 2000 roubles and I hope this small incident doesn’t’ spoil your impressions of / or time in Russia. Hey what a cool judge, and that all took just 3 more hours. Not a very good picture but I had to take it sureptitiously on my phone while the judge was out the room. 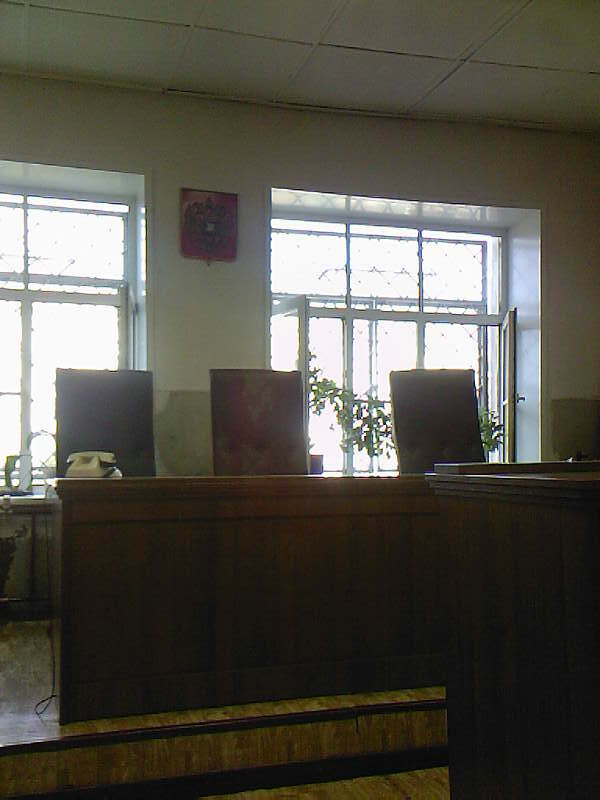 Why they had a seriously outdated phone on the judges bench was beyond me, but I liked the plant in the window making the room seem homely …NOT… tried to take a picture of the docs which had bars (no I didn’t need to sit behind the bars) but it didn’t come out.